A complete romantic experience with modern marina front luxury overlooking the yacht basin and incredible sunsets. Picturesque strolls in this Mediterranean inspired village delivers upscale clothing boutiques, souvenir shops, waterfront restaurants, live music, dolphin cruises, kayaking, fishing charters, sunset cruises, and so much more! Your own private covered balcony overlooks the action and becomes the spot for a special champagne brunch or luscious fresh seafood dinner. An over-sized whirlpool tub in the master suite makes your time here truly relaxing and rewarding. The beach is a little over a mile from the Villa. You’ll have beach access in Palmetto Dunes, right across the street. Your car pass gives you access to the parent plantation with free parking at the Dunes House which is also an oceanfront café and bar with facilities. From there you can walk down the beach next door to the Marriott which often features live music and an outside bar and café. If you don't want to drive, there is a free shuttle (Dunes Buggy) that will provide transportation. It doesn't really have a schedule it’s more like a free taxi. Bike rentals are also inexpensive on the island and they will deliver to you and pick up. There are bike racks on the property. You’ll never have to get in your car if you chose! There is an on-site pool and gas BBQ grill for your convenience. The Performing Arts Center – a live entertainment venue - is next door, as is the Chamber of Commerce where you can get info & maps. You will have your choice of several restaurants right on the harbor including Italian, right beneath the villa, several Seafood options and a Mexican cantina with outside live music, good margaritas and food! All are just steps out the door from you comfy little villa! The building has free secure gated parking and a gate w/ coded access for pedestrians leading out to the marina. Nearby numerous day spas, salon & tanning services. Nearby at the Towne Center, the islands newest shopping & entertainment complex is the Poseidon restaurant and many others and the largest Kroger store in the southeast with Starbucks, numerous deli, pizza & prepared foods. Whole Foods is in the TJMAXX plaza nearby as well as wine/liquor store. Owner is local, happy to help with any hospitality or villa related questions. 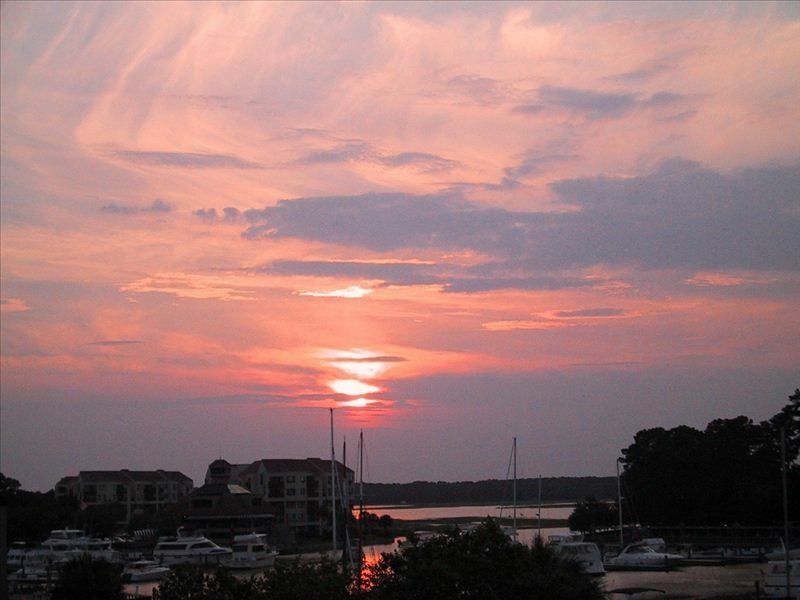 All that world renowned Hilton Head Island resort and beaches have to offer. Hilton Head is located a day trip away from the charming Southern Coastal cities of Beaufort, SC and Savannah, Ga. (45 minutes - home of cooking and restaurant guru Paula Deen and 'Midnight in the Garden of Good and Evil') as well as the historic, waterfront, architecturally stunning Charleston, SC (2 Hrs. drive). All offer a memorable glimpse of the Low Country past and are unique and delightful day trips replete with tours, incredible meals, beautiful gardens,scenic landscapes and abundant activities. *Harbourfest Events include spectacular fireworks and family entertainer/singer Shannon Tanner every Tuesday evening in season. Shannon Tanner performs every evening M-F.
Full payment 30 days prior to first day of rental is required to secure booking. Security deposit must be received to guarantee availability. Call for details. I am a local owner and have lived on the island for over 22 years. This spectacular villa was my bachelor pad for 12 years and I have wonderful memories and experiences while living on the harbour. I have been in the remodeling industry here for all those years and design and decorated the property to feel like your living in a true Mediterranean village while maintaining a romantic setting for your enjoyment. This property is steps away from several restaurants, live music, bars and shopping. You don't even have to leave the Shelter Cove Harbour the entire time of your visit since there is more to do and see in this one spot than most can take in in the time they are here. The harbour also offers dolphin cruses, fishing charters, boat rental, kayak rentals and much much more. The energy of this special place is intoxicating! Every Tuesday night during the summer season is Harbour Fest Night! Just below you private balcony is one of the largest parties on the island with food vendors, children's activities, music and at 9:00 pm they finish the night off with a spectacular fire works display and this property has front row seats for the display. toilet, tub, shower, jetted tub, Over size romantic jetted tub for 2! Located in Shelter Cove Harbour with the ocean about 1 mile from the villa. Wake up in the mornings from your 4th floor view of the harbour & head to your semi private beach access, the Dunes House!! Mediterranean style village located on a stunning harbour that connects to the ocean via the waterway. The property has a large wrap around balcony with expansive views of the yacht in the marina. The elevator is conveniently located steps (10') away from the villa's front door. Over sized wrap around balcony with expansive views of the harbour, yachts and sunsets. Great for people watching or having a relaxing glass of wine and dinner al fresco. Kayaks and paddle boards can be rented in the harbour near the harbour masters building. Boats and jet skis can be rented in the harbour near the harbour masters building. The property has a spiral staircase to the master bed room and bath. This is a mixed use development with residential living above multiple restaurants, bars, boutiques, shops, ice cream & candy parlor, dolphin watching cruises, crabbing cruises, Eco tours and other outdoor activities including music in several locations nightly. Book a fishing charter rent a boat or take a sunset cruise in the evening. All these attractions events and amenities are located on the marina front steps away from your villa! Absolutely lovely condo with fantastic art and appointments. Had been a bit worried that it would be noisy considering the location with shops, bars and restaurants located on the first level, but it was incredibly quiet unless we sat out on balcony to intentionally listen to music. Kelley was easy to reach if we had a problem and went out of his way to help us. All in all, a great trip! Thank you, Kelley! Very nice location and pretty villa. The bed was not very comfortable. We were very happy with the villa! It was really clean and the view was fantastic!! Karen, Thanks for the nice review but was anything wrong with the villa or is one star an over site? If something was that unacceptable please let me know so I can correct the issue. We enjoyed 5 days in paradise here! We had an issue with the TV early on but Kelley was so responsive and was able to talk thru the solution with us on the phone. In the heart of Shelter Cove and convenient to everything. We were able to just unwind and relax. Thank you! Stayed in this nicely decorated and ideally located condo from Jan 2 through 6 with my wife. Enjoyed the view of sunsets and walk around the marina. Seafood and other restaurants by the marina are the perfect place for dinner and enteracting with other residents and guests in the area. We had a great stay over the holiday.Very comfortable Great internet service. Location is really convenient to all HiltonHead has to offer. Kelly was great and quick to respond to questions.